Only 4 days until Halloween! How excited are we all? I'm pretty excited so I'm dedicating this special bumper edition of Friday Favourites to the spookiest date of the year! I am a huge Tim Burton fan (with the exception of Edward Scissorhands, which is my greatest fear, but we won't go there now!). I've never seen the original Frankenweenie or Victor but the trailer is beautiful. It's in black and white. It's quintessential Tim Burton. It's just stunning and I can't wait to see it. As well as being a huge Tim Burton fan, I am a massive fan of Derren Brown. We actually went to see his Enigma show for our anniversary and it was amazing. I also have a bit of a paranoia about the end of the world. So I am pretty excited about seeing Apocalypse tonight. It's going to be amazing! 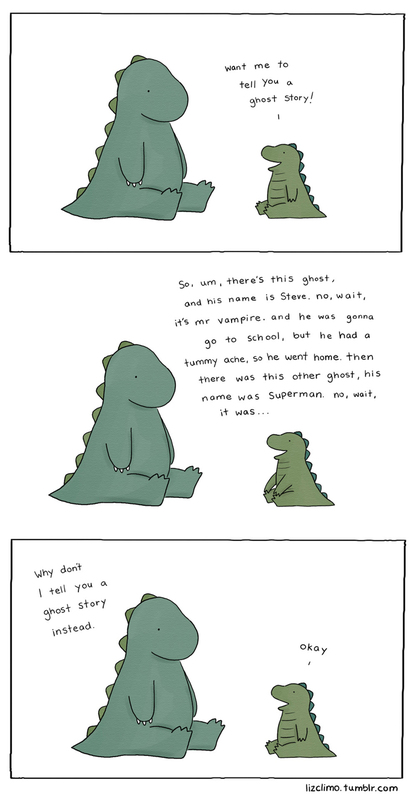 I stumbled upon an illustration by Liz Climo on Facebook. I looked her up and discovered the most adorable illustrations I have ever seen. I've mentioned my love of dinosaurs before and the dinosaur series is so cute it makes me want to cry. Luckily for me, she sells prints of her work. Christmas list sorted! Ok, I know Jeffrey Campbell Lita boots are pretty oversaturated right now but you can't deny that these are pretty special. The perfect Halloween boots. Black and green make me think of monsters, zombies and all things undead! I love this cute little crochet pumpkin by One Sheepish Girl. It's adorable and, if you're handy with a needle, you can find the crochet pattern over at her blog. Woohoo! Erm.. I've been thinking about getting that feather jacket. I'd wear it every day! Oh my goodness, buy it! You would rock that! Holy freaking s**t those boots are basically the best things ever and now I will see them in my dreams. Those nails are gorgeous and that pumpkin adorable!